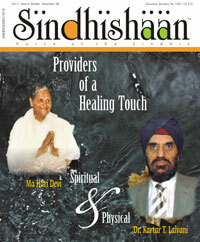 Thanks so much for the complimentary copy of the current issue of the Sindhishaan magazine. I noticed that you published the email exchange between Asha Rijhsinghani, Koshi Lalvani and me under the Sindhi mass conversion article. It took me by surprise. I can't believe 50,000 Sindhis of Ulhasnagar have recently converted to Christianity. That's a colossal number. Then again, I blame the Maharashtra State Governor and the Chief Minister of Bombay and the Bombay High Court for trying to evict the people of Ulhasnagar when they called for mass demolitions of their homes. They showed no mercy for the people. Apparently, someone was looking out for the interest of the Sindhis of Ulhasnagar, and came to their aid. And it was not the Sindhi leaders. It was the Christians. When a person and his family is being evicted from their home, and they have nowhere to go, or they are unemployed and have no means to feed their family, they will turn to those who come to their rescue. Back in the 50s and 60s when I was growing up in India, I attended a Christian convent school and a Jesuit college in Bombay (now Mumbai). I found the nuns of our school go and help the poor Indians of Bombay during the weekends. The nuns instilled good social and moral values in us, and taught us to respect our elders. So, I find nothing wrong with this conversion, especially since our Sindhi leaders did not come to the aid of their poorer breathren in their hour of need. Besides, I believe there is really only ONE God, irrespective of what form we would like to visualize him. Another thing you might want to take into consideration about the mass conversion of Sindhis to Christians. The Christians are classified as a minority race in India. As minorities, I assume they enjoy special privileges that other minorities of India do, such as “reservation” at educational institutions, government jobs, human rights protection, and others. If their rights are violated, they can always approach the United National Human Rights Commission. As poor Sindhi-Hindus, they enjoyed no such rights. But now, after the conversion, they do. For instance, if the state government were to evict them today from Ulhasnagar, they could always approach the U.N Human Rights Commission. They now have the protection that our own Sindhi leaders could not provide them. That makes 50,000 less Sindhis you can now approach to learn the Sindhi language and script. From hereon, I hope our Sindhis will show more compassion towards all people instead of gloating about their riches and properties. We are now seeing the world change before our very eyes. The status quo of greed and corruption cannot hold any more. We must all change in our ways.